The Bony Lipped Barb is a native freshwater fish species found in Thailand and throughout South East Asia. The Bony Lipped barb is a member of the cyprinidae family of fishes which is found in the Salween basin, Chaophraya basin, Mekong and Maeklong Rivers. 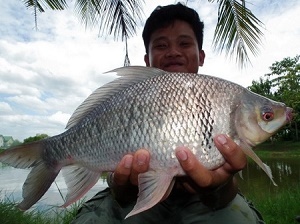 This Thai carp species feeds on roots of plants (Hydrilla verticillata), unicellular algae and some crustaceans and also feeds on periphyton and phytoplankton and is a popular food source for local inhabitants in the riverside communities of Thailand and is a regular capture made by local fishermen with nets. Bony Lipped Barb are not one of Thailand’s biggest species by far, but play an essential part in aquaculture and the food chain in the various bodies of water that they occupy and offer good sport when fishing with light tackle. May be caught on fly tackle.